In a region universally acknowledged to be of great Masonic antiquity, there have arisen in the past a number of private lodges in Munster whose antient craft origins might reasonably be designated as Time Immemorial. None, however, has a greater claim to this denomination than today’s First Lodge of Ireland. The oft-quoted year of 1731 as its point of departure is misleading, in that the Lodge quite clearly pre-dates the origin of the No. 1 Warrant by an indeterminate, and probably not inconsiderable, period of time. 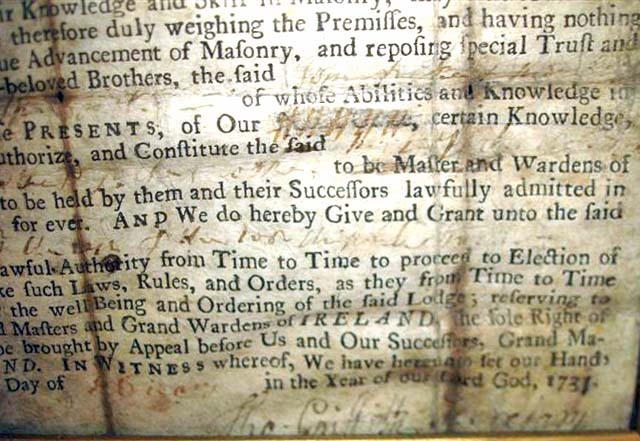 The unique early eighteenth century Transactions of the lodge – the oldest extant in the Irish Constitution – strongly suggest that fraternal activity within the original assembly at Cork, and its associated Grand Lodge of Munster, was already on a sound organisational basis prior to December 1726. It is interesting to observe that the first known reference to Masonic Deacons appears in the lodge Minutes of 2nd February 1727 – over eighty years before the Office was eventually adopted by the ‘Premier’ Grand Lodge of England in 1809. 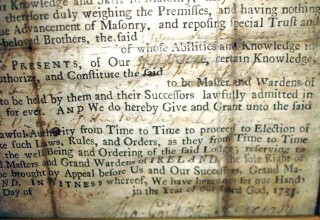 Whereas several of the well established Cork lodges of the early 1730’s were quick to make their mark with the developing Grand Lodge in Dublin – and applied for Warrants without undue delay – the lodge generally regarded as being the oldest of them all, today’s First Lodge, showed no such enthusiasm for this procedure whatsoever. It may be conjectured that members of the old private Lodge of Corke, who were also members of the venerable Grand Lodge of Munster, disputed the fact that – under the simultaneous, though hitherto separate, Grand Mastership of Lord Kingston of Mitchelstown, albeit a fellow Munsterman – the regional body lost its identity by being ‘united’ with the national Grand Lodge of Ireland in 1731. The outcome was that the ‘First’ Lodge at Cork – which may well have existed prior to the formation of either, or perhaps any other Grand Lodge – continued to work as a Time Immemorial assembly and apparently declined a Warrant from Dublin for a further thirty years. Eventually, in 1776, they were offered – and finally accepted – the unique No. 1 Warrant which now stands indisputably, as the oldest masonic warrant in the world. 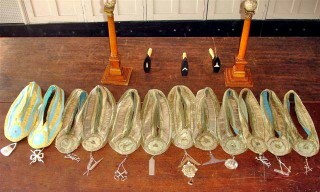 The regalia of the lodge is of similar antique origin in that – uniquely throughout the Irish Constitution – the member’s Aprons and the ancient velvet Collars of the Master and Officers are trimmed with gold braid. This is a distinguishing relic from the era of the Grand Lodge of Munster, to which the old early lodge of Cork was so closely affiliated in the early eighteenth century. A minute dated 27th January 1836 reads ‘Lodge No.1 met to dine and celebrate union with Lodge 27’. Evidently the W. M’s jewel of Lodge 27 was superior to that of Lodge No.1, as today the W.M. still wears that which belonged to Lodge 27. Finally, there are to this day in the First Lodge of Ireland, members of three old County Cork families – namely, the families of Crofts, Newenham and Wallis – whose ancestors formed part of the original time-immemorial assembly of the 1720’s, a further indication, perhaps, of the continuing durability of Freemasonry in the ancient Province of Munster. The First Lodge of Ireland has worked in CORK since time immemorial, certainly prior to 2 February 1726. Two other lodges also held the No. 1 Warrant in the early period – the first was meeting in DUBLIN by 1735 (Smith), but had ceased working before 1744 (Spratt); the other was established at MITCHELSTOWN, Co. Cork, 1 February 1732, and was still at work in 1746, but dormant before 1754. 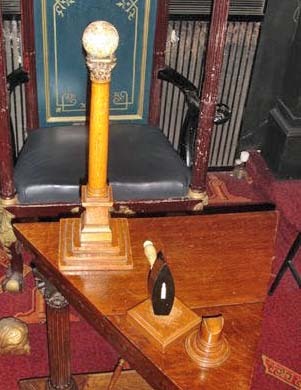 The First Lodge of Ireland has held the No. 1 warrant since 10 August 1776, and aside from a two-year hiatus – when the warrant was cancelled on 6 July 1826 until it was restored 2 October 1828, it has worked continuously.